HONG KONG—On June 17, the Justice and Peace Commission of the Hong Kong Catholic Diocese held the “Walking the Way of Cross with the marginalized to the reign of God” to reflect on the situation of Hong Kong. Hong Kong Cardinal Joseph Zen attended the Way of the Cross and served as the main celebrant at the Mass. During the interview, he said that his wish was that Hong Kong would soon implement general elections, even though there has been no progress due to resistance from the Beijing policy makers. Cardinal Zen refused to comment on the recent remarks made by Chinese officials such as National People's Congress Chairman Wu Bangguo regarding Hong Kong's autonomy. However, he did comment on the general election being halted by Beijing and said, “It [the general election] has stopped. It's very hopeless. They caused the disruption, but we are the ones who get blamed. We felt very hopeless.” He called on the public to join the July 1 demonstration to call for general elections in Hong Kong. He also mentioned that the general election should be implemented and the sooner the better. Under Cardinal Zen's lead, more than 100 representatives from the Catholic groups walked the way of Cross. They held crosses, starting from Queen's Pier, passed the Legislative Council, the Court of Final Appeal, the Hong Kong Government and ending at the Cathedral of the Immaculate Conception. As indicated, every landmark signifies a social issue, including social disparity, freedom of speech, assembly and association, the democratic system, racial integration, education, and so forth. Cardinal Zen also pointed out that in the past 10 years after the takeover of Hong Kong by the communist regime, the situation of vulnerable groups in Hong Kong has not improved at all. Instead it is worsening. Nonetheless, he believes that Hong Kong has the wisdom and potential to resolve these issues and it is critical to create social awareness. 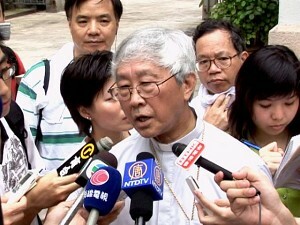 He also mentioned that he would pray for the Chief Executive Donald Tsang.